The Rays will designate first baseman C.J. Cron for assignment, Marc Topkin of the Tampa Bay Times reports on Twitter. He had been projected by MLBTR to earn $5.2MM in arbitration. That’s just one of a flurry of late-breaking 40-man moves for the Rays. Relievers Oliver Drake and Hoby Milner were also designated, while right-hander Jose Mujica was outrighted. All those precious roster spaces were needed to allow the team to add a host of new talent — and thereby protect it from the upcoming Rule 5 draft. Lefties Kyle Bird and Brock Burke, righty Ian Gibaut, and outfielders Joe McCarthy and Jesus Sanchez are all now on the 40-man. It’ll certainly come as a surprise to some that Cron is on his way out of Tampa Bay. After all, the club was rewarded for nabbing him from the Angels last year. Cron drove the ball over the fence thirty times and produced a strong 122 wRC+ with his .253/.323/.493 slash. Of course, the Rays rarely rest on their laurels — or indulge in excessive spending. While Cron isn’t slated to command an immense salary, and the Rays actually have ample payroll space with which to work, the earning power of players of his kind has been gutted in recent years. That’s not to say that another organization won’t see the value. It doesn’t hurt that Cron is still controllable for another campaign. Yankees sophomore sensation Aaron Judge is still feeling pain when he swings a bat, per a tweet from Marc Carig of The Athletic. Certainly there’s still time for him to regain his health and strength in advance of the postseason (we still have three weeks until October, after all), but the news has to be disconcerting both for the Yankees organization and for Judge himself. The outfielder has been out of commission since July 26th after sustaining a chip fracture in his wrist, and though it was reported as recently as yesterday that he could be nearing a return after he was able to participate in on-field drills, the news that his pain level (still describes as a “4” on a 1-10 scale) casts some doubt on the notion that he could be back on the field within the next week or so. In light of the Rays’ success with creativity this season, Marc Topkin of the Tampa Bay Times details some of the most interesting aspects of the club’s strategy in 2018. Carig explores various aspects of the club’s advances back to contention, highlighted by the purging of veterans in order to bring focus to a new, young core. The coming out parties for players like Jake Bauers and Joey Wendle have been fun to watch, to be sure. But equally interesting has been their improvements in much broader aspects of the game: a few mentioned by Carig include the team’s improvement on the hard contact and line drive front, trimming of strikeouts, spike in batting average, and, of course, the adoption and implementation of the “opener” strategy. The Rays have promoted outfielder Justin Williams to the major league club for the first time, Marc Topkin of the Tampa Bay Times reports. To make room for him on the active roster, they’ve optioned lefty reliever Hoby Milner to Triple-A. Williams, who’ll turn 23 next month, was the Diamondbacks’ second round pick in the 2013 draft. He came to the Rays as part of the return for sending right-hander Jeremy Hellickson to Arizona, and has posted above-average offensive numbers at every level of the minor leagues since then. At the Triple-A level so far this year, Williams has posted a .276/.323/.392 slash with a 6.7% walk rate and a 21.0% strikeout rate. At the Double-A level last season, he managed to hit .301/.364/.489 across 409 plate appearances. MLB Pipeline ranks Williams among the club’s top ten prospects, checking in at #8. Though he hit a career-high 14 home runs last season, the publication notes that scouts expect him to develop more pop in his bat due to the fact that he still hits a lot of ground balls; something that could change as he continues to improve his swing. Baseball America describes him as a hitter who makes consistent contact and manages the strike zone well, in part due to improving pitch recognition. BA goes on to say that he turns on inside pitches well but may need to make some adjustments in order to do a better job covering the outside of the plate. TODAY: Rays manager Kevin Cash didn’t provide Topkin and other reporters with a clear timeline on Ramos’ injury, as the catcher had yet to be fully examined by team doctors. Still, Cash said “I think it’s fair to say he’s going to miss some time” in the form of a DL stint. SATURDAY: Rays catcher Wilson Ramos has a hamstring injury, Marc Topkin of the Tampa Bay Times reports via Twitter. The 30-year-old backstop will sit out the All-Star game, and said he expects he’ll end up on the disabled list. Obviously, the 49-46 Rays will miss having Ramos for any length of time, as the downtick in production from the All-Star to their backup catcher Jesus Sucre is significant (to put it lightly). The veteran backstop has been worth 1.8 fWAR to date, in large part due to a .297/.346/.486 slash line and a 130 wRC+ that easily ranks highest among MLB catchers. But as the Rays aren’t considered contenders for a playoff spot in a lopsided American League (and particularly unlikely to catch up to their two juggernaut AL East foes), the more pressing implications come from Ramos’ trade value. It’s possible a hamstring injury could sideline him for a couple of weeks, depending on the grade of the strain. That would take us through the July 31st non-waiver trade deadline, by which the Rays had surely hoped to trade Ramos for players who could help them in future seasons, not to mention unloading his remaining salary from their ever-tight payroll. Even if Ramos misses only the 10-day minimum, he’ll have just a few days to prove his health to contending teams in order to return to full value in the eyes of potential trade partners. It’s at the very least another knock on him in terms of overall durability; he’s already dealt with knee and hamstring injuries throughout the course of his career. 7:24pm: The Mariners will receive $4.75MM from the Rays, per Tim Booth of the Associated Press (via Twitter), an amount that rather significantly alters the math of the trade. 5:16pm: In a stunning early-season swap, the Mariners have acquired reliever Alex Colome and outfielder Denard Span from the Rays, as Marc Topkin of the Tampa Bay Times originally reported on Twitter. Righties Andrew Moore and Tommy Romero will go to Tampa Bay in return, as Tim Brown of Yahoo Sports (via Twitter) and Ryan Divish of the Seattle Times (via Twitter) first reported. An as-yet-unknown amount of cash is also going to Seattle in the swap. Reliever David Phelps, who is out for the year after undergoing Tommy John surgery, was moved to the 60-day DL to open a roster spot. M’s GM Jerry Dipoto has overseen his fair share of surprising swaps since taking the helm in Seattle, and this certainly rates near the top of the list. The club is off to a nice start (29-20), but just lost Robinson Cano for eighty games (and the postseason) due to a suspension and Dee Gordon for a stretch due to a broken toe. Colome is surely the headliner of this deal. He has served as the closer in Tampa Bay for the past three seasons, racking up 95 saves in that span. He’ll be eligible for arbitration one final time over the offseason, so there’s some future value here for the M’s. When he moved to the bullpen full-time in 2016, Colome looked like a star. But he wasn’t quite as exciting last year, when he carried a 3.24 ERA but managed only 7.8 K/9 against 3.1 BB/9 for the year. Of particular note, his swinging-strike rate dropped to a less-than-dominant 11.6% level. It has been something of the opposite story thus far in 2018. 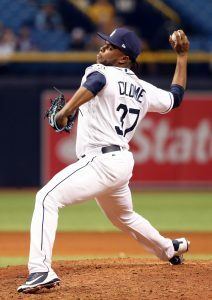 Colome sports only a 4.15 ERA but has struck out 9.6 and walked 3.3 batters per nine while carrying a 54.5% groundball rate. A low strand rate (65.4%) and high BABIP-against (.354) help explain the discord. With Colome having returned to a healthier 13.9% swinging-strike rate and continuing to deliver his typical 95.5 mph heater and ~89 to 90 mph cutter, the Mariners will bet that he returns to more dominant results in a high-leverage role. Of course, they won’t ask him to handle the ninth, which will likely remain the domain of young fireballer Edwin Diaz. Span has now been dealt twice in the final year of his contract. The 34-year-old no longer moves as well as he once did, but is still a polished hitter. He is off to an interesting start to the 2018 season, carrying a whopping 16.2% walk rate (well above his career average) and a typically stingy 13.9% strikeout rate. He’s producing at a solid .238/.364/.385 rate despite carrying a meager .259 batting average on balls in play and quality of contact estimates (.359 xwOBA vs. .332 wOBA) that suggest some poor fortune. On the other side of the agreement, the Rays have again acted to shave a fair bit of salary obligations. It’s hard to avoid the conclusion that the ability to move Span’s contract — which itself was acquired only to offset partially the money the Giants took on in the offseason’s Evan Longoria swap — was a strong motivating factor. Still, they’ll also recoup some talent here. Moore, 23, has had plenty of success in the minors and reached the big leagues last year. He’s not really regarded as a high-ceiling hurler, but could be a near-term option that fits the Rays’ current model that relies upon multi-inning relievers. Moore owns a 3.04 ERA in 50 1/3 innings this year at Double-A, allowing six home runs on 38 total hits while maintaining a 47:14 K/BB ratio. Romero, 20, was a 15th-round pick last year. But he has shown well thus far as a professional. In his 44 innings in the current campaign, which have come over nine starts at the Class A level, Romero owns a 2.45 ERA with 11.0 K/9 and 3.1 BB/9. The Rays have released right-hander Evan Scribner, per Marc Topkin of the Tampa Bay Times (via Twitter). The move comes just about a month since Scribner signed on with Tampa Bay. Scribner, a 32-year-old reliever, had made just one appearance this spring, throwing a clean frame. Evidently, the Rays did not like what they saw or the sides both decided to go their separate ways. It seems that Scribner will need to earn his way back to the majors with another organization. He has seen at least some MLB time in each of the past seven seasons, working to a 4.15 ERA and 8.3 K/9 against 1.5 BB/9 in 169 frames. Remarkably, he handed out just six walks in his 93 most recent major-league innings. Unfortunately, injuries limited Scribner to just 33 2/3 innings at all levels over the past two seasons. The Rays have designated infielder Ryan Schimpf for assignment (h/t Marc Topkin of the Tampa Bay Times). The team needed his spot on the 40-man roster to make room for the recently-signed Carlos Gomez. The 29-year-old Schimpf made his major league debut with the Padres in 2016, posting a .217/.336/.533 batting line across 330 plate appearances en route to 2.5 fWAR. However, he followed it up with an unfortunate .158/.284/.424 line with a 35.5% strikeout rate in 2017, which led him to a replacement-level campaign. Fangraphs.com described him as “the poster child for the fly ball revolution going too far”, noting that his first two MLB seasons rank second and third in fly ball rate among all player seasons dating back to 2002. The Rays had only recently acquired the left-handed hitter back in December, shipping out minor leaguer Deion Tansel. While he could clear waivers, there are probably a number of other clubs who might be willing to take a chance on his power and walk rate. The Rockies, for example, are in need of a utility infielder after learning that Pat Valaika and Shawn O’Malley are expected to miss time. The move seems even more curious considering Schimpf was projected to make the Rays’ opening day roster as a bench player. Instead, the team will likely rely on a mix of Joey Wendle and Daniel Robertson behind a starting infield mix that includes Brad Miller, C.J. Cron, Adeiny Hechavarria and Matt Duffy until Christian Arroyo and Willy Adames force their way onto the MLB scene. The Major League Baseball Player’s Association has initiated a grievance proceeding against the Athletics, Marlins, Pirates, and Rays regarding those teams’ spending of revenue sharing dollars, according to a report from Marc Topkin of the Tampa Bay Times. This general issue has been percolating for some time, even as additional concerns have arisen as to the pace of free-agent signings over the 2017-18 offseason. The MLBPA reportedly engaged with the league office over the Miami and Pittsburgh organizations’ spending earlier this year. At the time, MLB and the teams at issue rejected the idea that there was any issue worth exploring further. Clearly, the union disagrees and also feels that two other organizations’ practices merit examination. Per Topkin, the complaint relates to spending both last year and over the present offseason. Revenue-sharing dollars — which will be phased out for the A’s under the current Basic Agreement — are required to be spent for improving the MLB performance of recipient clubs. That doesn’t necessarily mean it all must go to player salaries, but though teams are required to report on how they use the money. And as JJ Cooper of Baseball America notes on Twitter, successive collective bargaining agreements have tightened the permissible uses. Enforcing the provisions relating to these funds falls in the domain of commissioner Rob Manfred. He can issue penalties, require the submission of a two-year plan, and even order changes with that plan (“after consultation with the Players Association”). As Topkin notes, it is not immediately clear what the MLBPA is seeking in relief. The collectively bargained provisions do seem to give the union an interest in ensuring the provisions are followed, though, and perhaps the situation is seen as drastic enough to merit a test of their meaning before an arbitrator. In a statement to the Times, the league confirmed receipt of the grievance but stated that MLB “believe[s] it has no merit.” Pirates president Frank Coonelly responded with a combative tone, issuing a statement labeling the action “patently baseless” (via MLB.com’s Adam Berry, on Twitter). Rays owner Stuart Sternberg defended his own organization in less strident terms (via Topkin, on Twitter).